This 11,000-square-mile (28,490-km2) U.N. World Heritage Site in Oman’s central desert and coastal hills is as well the only wild breeding site on the Arabian peninsula for turkey-like endangered houbara bustards, long-legged striders of barren, open places. Here too is the largest wild population of Arabian mountain gazelles—some 5,000, with rare dorcas and sand gazelles, goat-like Nubian ibex, sand cats, red and Ruppell’s sand foxes, honey badgers, jackals, and a few caracals and Arabian wolves. Golden eagles nest, as do spotted thick-knees, crested larks, little owls, and coronetted and chestnut-bellied sandgrouse, which fly 40 miles or more (70 km) to fill belly feathers with water droplets which they bring back to nestlings. Coastal beaches and lagoons attract flocks of resident and migrant waders including gulls, terns, flamingos, herons, and several duck species. The reserve is crossed by large numbers of spring migrants, including bright European rollers. Over 20 reptile species include carnivorous desert monitors and rare Thomas’ spiny-tailed lizards. Vegetation, though sparse, includes 11 endemic species. Near Saiwan is evidence of ancient human habitation. Serious problems in this large reserve, difficult to patrol, are poaching of oryx for meat, hides, and exquisite horns, also overgrazing by domestic herds and lack of regeneration in old woodlands. The Oryx Introduction Project at Yalooni has limited accommodations for visitors. Most international visitors fly to Muscat with wide range of accommodations, rental cars, busses with daily service to all main provincial towns, domestic air to several, and comprehensive system of long-distance taxis and microbusses, also many tour operators. Ra’s al Hadd Turtle Preserve in the Wilayat of Sur, 26 miles (42 km) of coastline where an estimated 20,000 sea turtles come ashore to nest annually—most important green turtle nest site in the Indian Ocean. Visitation possible with permit from Director General of Nature Reserves. During October/November Muscat is said to be raptor capital of the world, with great numbers of migrant steppe eagles, greater spotted eagles, long-legged buzzards, various kestrel species. In Salalah in December/January, waders and waterfowl are attracted to the many khors (inlets) in and around the city—storks, flamingos, herons, gulls, terns—and in May, migrants from Africa, including European rollers, didric cuckoos, gray-headed kingfishers. Masirah Island, with 331-species birdlist—best times September–November; shell-strewn beaches; world’s largest loggerhead sea turtle nesting population, with some 30,000 coming ashore to lay about three million eggs every June–August. One small hotel. Colorful blue-cheeked, European and little green bee-eaters nest along the Batinah Coast. Steppe eagles are members of the Aquila genus known as true eagles: Large and aggressive, with formidable beaks and claws, lancet-chaped head and neck, and feathers that cover the legs. They soar holding wings straight out, with wingtips spread like fingers, preying on small and medium-sized mammals - although when termite populations explode, they can gather in large flocks and each consume up to 2,000 termites a day. 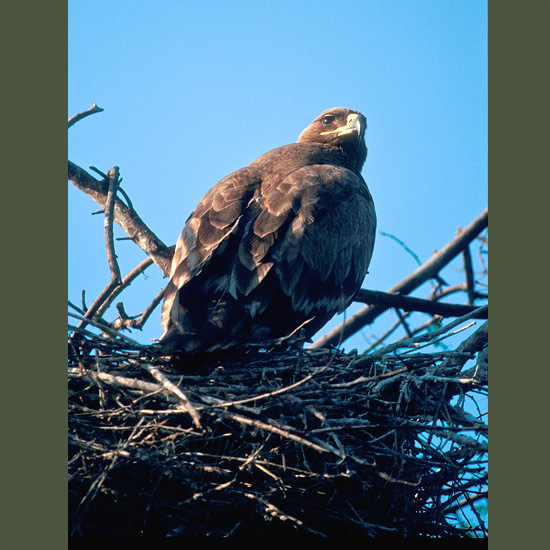 Steppe eagles inhabit open country including arid steppe and semidesert; nesting in Africa and southeastern Europe through India and China to Hainan; wintering south to Myanmar and the Malay Peninsula.